(Nanowerk News) Researchers at the University of Illinois are contributing to the development of more environmentally friendly catalysts for the production of plastic and resin precursors that are often derived from fossil fuels. The key to their technique comes from recognizing the unique physical and chemical properties of certain metals and how they react with hydrogen peroxide. Many plastics are made from molecules called olefins that are derived from organic materials such as fossil fuels. To form these types of plastics, olefin molecules must be altered using oxidizing chemicals to make plastic and resin precursors, called monomers, by rearranging their chemical bonds so that they can reach out and grab on to other monomers. This allows them to stitch together into long molecular chains - the building blocks of plastics, said David Flaherty, a professor of chemical and biomedical engineering. 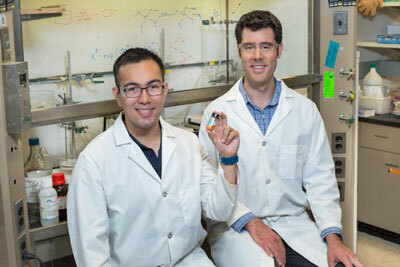 "The current methods used for turning olefin molecules into something useful also uses or produces things we don't want, like chlorine, which can be corrosive, and CO2," said Daniel Bregante, a chemical and biomedical engineering graduate student working with Flaherty, and a co-author of a report on the new method. Illinois professor David Flaherty, right, and graduate student Daniel Bregante are working on a greener way to produce plastic and resin precursors that are derived from fossil fuels, a process that might ultimately lead to broader industry adoption of this fine-tuned and environmentally conscious version of a much older process. Carbon dioxide is often thought of as a waste product of fossil fuel combustion. However, Flaherty said a significant amount of CO2 forms from the production of plastics derived from fossil fuels. Many production processes use environmentally dangerous organic peroxide or chlorinated oxidants, Bregante said. Together, these concerns have prompted the researchers to explore greener options for plastics manufacturing. In a paper published in the Journal of the American Chemical Society ("Periodic Trends in Olefin Epoxidation over Group IV and V Framework-Substituted Zeolite Catalysts: A Kinetic and Spectroscopic Study"), the group looks at how and why the identity of certain metals, called transition metals, affect the reaction. They also studied how efficient the process is when using hydrogen peroxide - an environmentally friendly oxidant whose only waste product is water, not chlorine or CO2. To form the critical monomers, olefins and oxidizers pass through tiny, rigid spongelike structures called zeolites. These zeolites contain metal ions in the pore spaces that act as catalysts to push the chemical reaction toward the plastic-producing pathway, Bregante said. "This process has been used for decades," Flaherty said. "Yet, the underlying reasons for how the metal atoms activate hydrogen peroxide and why some metals are better than others for this chemistry have not been fully understood." Flaherty's group said their reaction can take two pathways: one that leads to the formation of monomers and one that leads to the wasteful decomposition of hydrogen peroxide. They have proved in their latest research that the two pathways will respond differently depending on which metal is used, and the next step will be to look at how altering the pore size of the zeolites will affect the reactions. By unlocking more of the mysteries of this reaction, Flaherty and Bregante said their research might ultimately lead to broader industry adoption of this fine-tuned and environmentally conscious version of a much older process. "We need to know not only that it works, but also how it works to convince industry to make the switch," Flaherty said. "The facilities used to produce plastics are starting to reach the end of their useful lifetime, and new industrial infrastructure based on this revised method could be a fresh start."